Stores ref. 6E/340, reissued as 6E/50. Swiss made 15-jewel movement. White metal case approximately 5cm diameter. 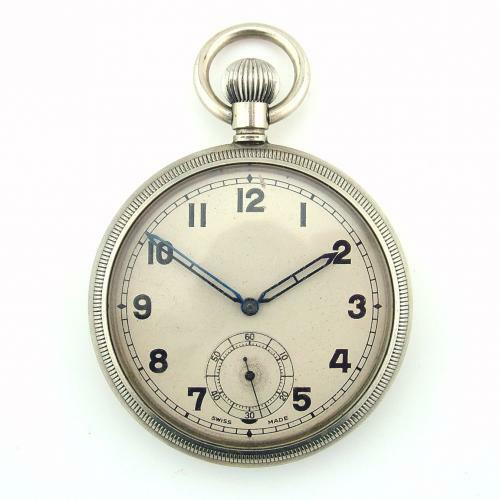 White dial with Arabic numerals and 'blued' hands plus subsidiary seconds dial. Non luminous. Screw backed case with Air Ministry 'A.M.' markings, '6E/50', serial number and 1941 code engraved. The dial is in lovely clean condition and the 'crystal' has only minor marking. The case has normal wear and tear but no damage. Good working order when test run for 24 hour periods. Pocket watches like these were preferred by navigators who found it easier to place the watch on their maps and charts whilst working. Stock code C21113.